79 years ago, a beautiful new school opened its doors in Walkerville. Designed by architects Pennington and Boyle in Collegiate Gothic (the traditional style of the 1920s), Walkerville Collegiate Instiute cost $600,000 at a time when the town of Walkerville had a population of 7500. Official opening of WCI was November 2nd, 1922. Celebrations included a luncheon, a dance, a swimming exhibition and a program of "moving pictures." In that first year enrolment was 195 students. The staff included Principal Robert Meade and nine teachers. 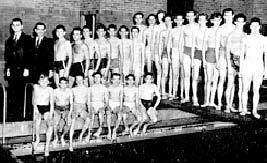 The original building contained 22 classrooms and other areas including: manual training for the boys, household science for the girls, a wood paneled library, a 48 by 80 foot gymnasium, an 800-seat auditorium with a 42-foot stage and a pool known as "the Plunge." Also during the first year, W. D. Lowe Vocational School used the second floor of W.C.I. until moving into their own building on Giles the following year. Walkerville Collegiate also housed the offices of dentist Dr. Dean, Dr. Phelps, M.D. and school nurse Miss V. L. Leavette. In 1923, lunch was served in what is now the Family Studies room and usually consisted of soup and crackers or hot dogs and beans for five cents. The kitchen and cafeteria were completely renovated in 1990. When the town of Walkerville amalgamated with the city of Windsor in 1935, enrolment grew; soon all the rooms at WCI were in use. The students and staff of Walkerville developed a fierce pride in their school, which was renowned as one of the top schools in the province. The famous Cameron-kilted Cadet Corps, with its own bagpipe band, were the best in the province. Walkerville also had a reputation for consistently producing champion athletic teams. As the schools population grew (peaking in 1970 at 1287), new rooms were added: in 1955 a music room, rifle range and, quartermaster stores (later converted into an industrial arts facility and now a media arts facility including a dark room and computer lab, a new gym and cafeteria); in 1966 the main office was revamped, a new library was built, as well as more classrooms. Today, the Walkerville student council is still known as the Agora, taken from the name of the public square in Athens built in 500 B. C. Agora evoked the spirit of democracy for it was in the Agora of ancient Athens that the assembly met in session and its officers were elected by the citizens. Agora membership was voluntary in 1934 and required a fee of 15 cents to cover expenses. Today members are elected by the students and the fee has increased tenfold to $15. The Agora established the Honour Society in 1960, to recognize individual effort in academics, athletics, service and clubs. Honours included everything from medals to having ones picture hung in the library  a supreme honour. Currently, Walkerville is known for its excellent art program  the Windsor Center for the Creative Arts. Previously, the visual arts program was centered at W. D. Lowe until the principal at Lowe decided to convert the art room to a weight training room. "my memory froze in its tracks"
Today I received a copy of the May, 2001 issue of The Walkerville Times. I am in my 75th year and I can tell you that reading this issue just froze my memory in its tracks. I arrived in Walkerville when I was three years old. My father, Wilfrid Swanson, had just been installed as head of the Science department at Walkerville Collegiate. He taught chemistry to grades 11 and 13. At Walkerville Collegiate, I remember teachers Ian Allison, Cecil Bunt, Charlie OBrien, Archie Fletcher, Wilmot Ball, Miss Auld, Miss Bourgoyne, Miss McLaren and, of course, my father who taught me for two years. It was war time and so a lot of our environment and exposure reflected that fact. For example, we had a military unit within the student body, a battalion I think, and all the male students participated. I think Jack Leighton and Brian Easton were commanders at one time or another. I was in the band because I thought their scarlet tunics and plaid kilts were dashing. I also was a member of the Dominion Marksmen rifle team. I recall Paul Martin Sr., MP for Essex County, addressing us in the auditorium, excoriating the Hun and whipping up our support for the war effort. Such an event often concluded with the singing of "Therell Always Be An England" or "The White Cliffs of Dover" with great patriotic fervour. On the light entertainment side I remember the school tea dances at WCI and having the hots for Jane Harmon, Peggy Coulter, Gloria Verway and Beth Crittenden and a few others that fail my recall abilities. The grad dance was neat because the guys could wear our fancy Scottish uniforms. I also remember Bill Kerrigans band. In fact, I just recently received a CD produced by Bill Grundy and his trio, currently resident in Edmonton. He still blows a mean clarinet. A few years ago I attended the 75th anniversary reunion of WCI. It was really neat. The organizing committee had certain rooms in the school designated for certain years which helped me zero in on Murray Binckley, Peggy Coulter, Ward Purdy, Jack Woodrow, Jack Fry and others of that vintage. It was just great fun. My dad died just thrtee months short of his 96th birthday. He curled and lawn bowled until he was 92.Thanks to my friend, Jack Fry for bringing back so many happy memories via your paper. One of lifes great pleasures is a memory or two. I have many of them and not a few are associated with Walkerville, Ontario.